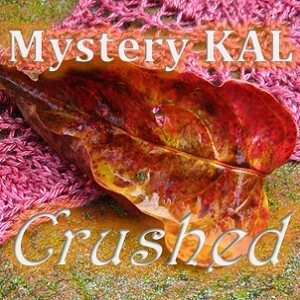 I am very excited to announce my very first Mystery Knit-Along: Crushed. 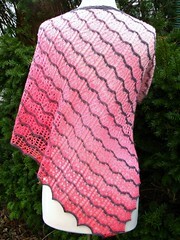 As I have mentioned, I am working on a three-pattern collection of lace shawlettes. Each one is made from a single skein of sock-weight yarn. I’ve finished the samples and written the patterns for the first two, and I’m in the process of testing them. The third will be done soon. I will be offering one of the patterns FREE as part of a Mystery KAL during the month of November. I would like to invite all my readers to join this KAL. I will be hosting it in the Remily Knits forum on Ravelry. Sounds fun! Maybe I’ll try this for a holiday present…hmmmm. Come on it, the water’s fine! That loos fun! I’ve only done a couple mystery KAL’s before but I definitely think I’m in on this. I love doing mystery shawls and I can’t wait to start this one. I was wondering, can this be done without the nupps? I don’t mind doing them but prefer not to. Thanks for the KAL. Yes, absolutely. You may omit them, or replace them with a seed bead — I would use #6 or larger. my first kal! Got mixed up with another one, but straightened it out today. Just finished clue 1, so I’m a little behind but…! I’m using 2 markers for the middle stitch. I re-place them in the correct position on the purl side. Tried the one movable stitch, but kept putting it in the wrong place. My yarn is dark maroon, and I knit at night, etc! It’s working for me very nicely. I was also going to put in beads rather than the nupps as I only have 350 yards (and the beads are less work!!). Excellent! Glad to have you join in.